From January 23th to 26th 2018, the leading political and business leaders from around the world will meet in Davos, Switzerland. To ensure you stay online and connected with your associates in Davos and at home during this important event you need the Travelers Wifi pocket Wifi router. 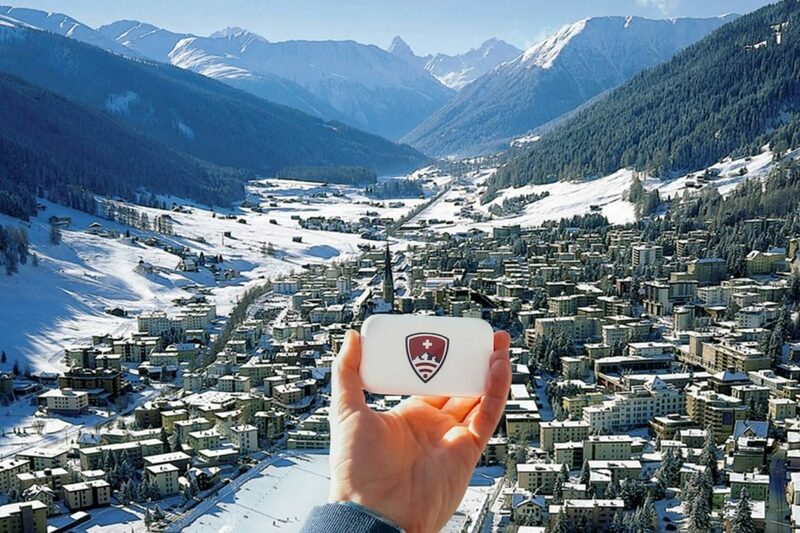 The Travelers Wifi pocket router is small, light and gives you unlimited, high-speed data all over Switzerland. As well as offering great coverage all around Davos, you get unlimited high-speed data (4G/LTE) that you can share with up to 10 users simultaneously. Because you probably wont have a lot of spare time to get to the first meeting in Davos, we want to provide you an overview of the simple and easy ways you can get a Travelers Wifi device on the road to WEF Davos 2018. Once you pick up your bags and have passed through the customs exit you will find us next to the arrivals area (Arrivals 1 & 2) at the Infodesks. Also, above the shopping area, next to the elevators at Car Park 2 you can ask for a Travelers Wifi at the Service Center. Arriving by train in Zurich? At the Tourist Information Office in Zurich’s main train station you can walk in and pickup your pre-booked device, or you can make a booking on the spot. Monday – Friday: 08.30 a.m. – 7.00 p.m.
Saturday: 09.00 a.m. – 06.00 p.m.
Saturday: 08.30 a.m. – 12.00 p.m.
Monday – Wednesday: 09.00 a.m. – 6.00 p.m.
Driving by car to Davos? Just next to the autobahn exit at Landquart, in the direction to Davos, you can make a quick stop at the Post Office Landquart and pickup your online order. Monday – Friday: 07.30 a.m. – 6.00 p.m.
Saturday: 08.30 a.m. – 11.00 a.m.
Do you want to receive your order in Davos? You can get it at one of the post offices in Davos (Davos Dorf or Davos Platz) or we can deliver it to any address in Switzerland. Monday – Friday: 08.30 a.m. – 12.00 p.a, 2.00 p.m. – 6.00 p.m.
Monday – Friday: 08.30 a.m. – 6.15 p.m.
Do you prefer a delivery to your accommodation in Switzerland?